October horribilis has now passed and the 5650-support level has held up. 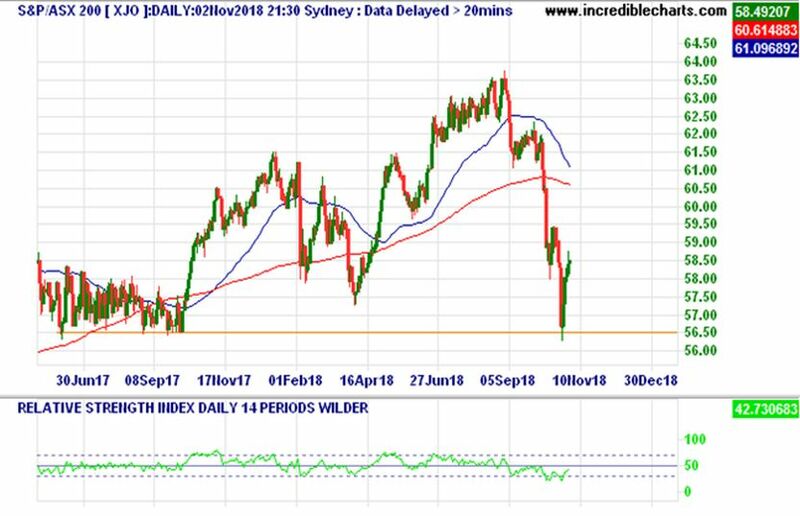 The ASX 200 is now having the counter trend back towards the 200-day moving average where it will test for resistance. That of course assumes the ASX 200 reaches the 200-day moving average. There is a very good possibility that it won’t, considering the significant sell off over the past few months indicating a Bearish shift in momentum. As far as levels goes the 6000 to 6100 level will be one to look out for before another possible retreat. On the positive side the 5650-level held up so this may provide some support on the next sell off. 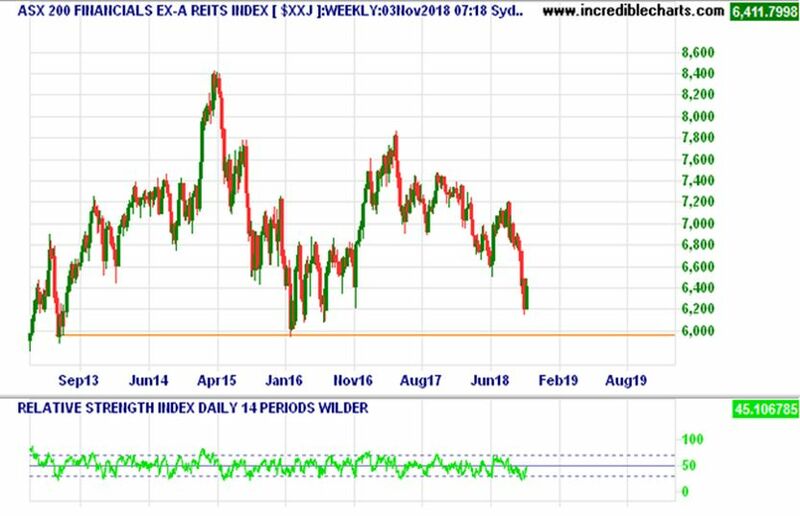 A lot will depend on our Financial sector which you can see in the below weekly chart still has some room to go down before the next support level is hit. February will be an interesting month to hold out for with the Hayne commission report recommendations. This could go either way with the recommendations being on the light side for the Banks considering their funds already committed to possible recommendations a positive. The Banks are trying to get ahead of the game and take the pain now only to benefit in February when the recommendations aren’t as severe as expected. That is the hope at this stage. Obviously, it could go the other way. AMP shareholders should be the most concerned with a large part of their financial planning model based on the grandfathered trail commission system. Either the planners will be hit or AMP. Will be interesting to see how this plays out. 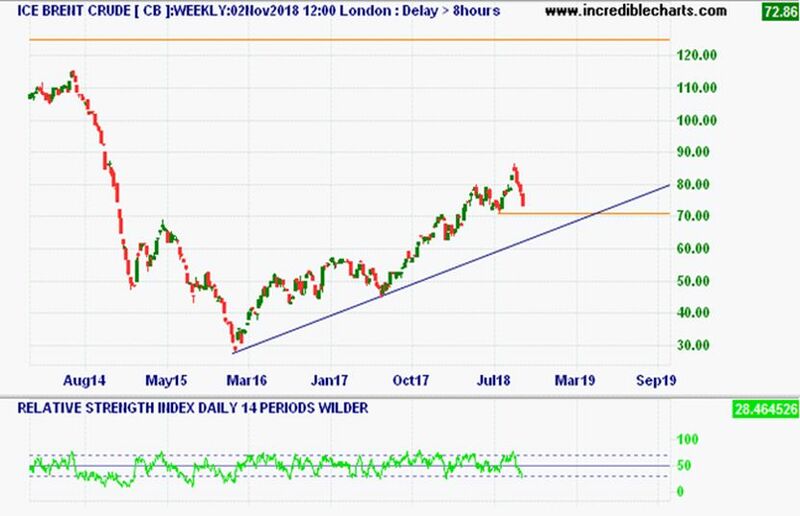 On the International front which could affect our market is that Oil is ready for a move back up after it has had a decent counter trend in a medium-term uptrend. This isn’t great for our local market considering the high levels of debt most homeowners hold and their low level of savings. Consumption will be curtailed if more is spent on fuel. This combined with home prices dropping further and the media loving the negative property headlines which feeds into investors psyche. Enjoy your week!